Google Buzz is an increasingly popular social media network. People are started using it and getting to know about it more every day. One area I have felt its absence is in cellphone applications. While there are countless Facebook and Twitter clients for cellphones, I have yet to find a Buzz client for smartphones. 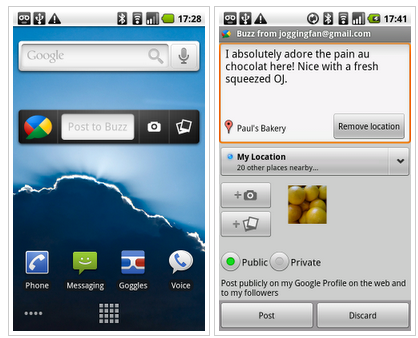 Thankfully Google has taken the matter into its own hands and released a Buzz client for Android phones. Nothing could be better than a Google-released application on a Google-OS for a Google service. Android phone owners can use this application to post text and photos onto their Buzz account with a single tap. Moreover users can tag their uploaded photos with the location they are posting the image from. The application is designed in a way that all the uploading takes place in the background and does not require our constant supervision; this way we can take a picture of what we are doing, start uploading, and continue with our activity. The application is called Google Buzz for Mobile. Android users can search for its name by accessing the Android Market from their handset. Note that currently it is only available in English and compatible with phones running Android 1.6 and later.